I never really thought I would be getting excited over a toothbrush, but….here we are. I’m feeling like this is “adulting” at its finest. 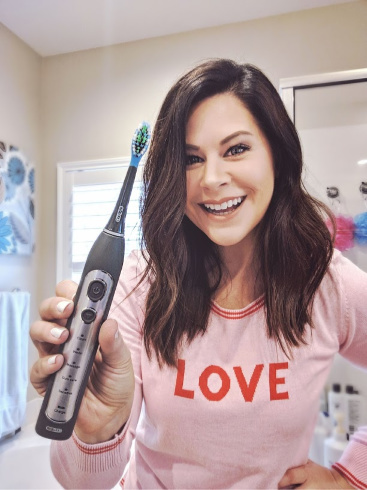 A couple of months ago, Smile Brilliant reached out and asked if I would like to try their cariPRO electric toothbrush and with my goals set on improving my personal health, why wouldn’t I want to include my teeth? Plus, I’m usually all about any type of product that requires a charging cord ;-) Bring it on! I always strive for a nice clean and bright smile, so once I unpackaged the toothbrush, I was thrilled to see the five cleaning modes on the toothbrush (clean, white, massage, gum care, sensitive). They’ve covered everything! Plus, with 40,000 vibrations a minute, I was getting some serious cleaning action. Another feature that was so helpful is the auto-interval smart timer. You are supposed to brush your teeth for two minutes each time, but how many of you ACTUALLY pay attention and time yourself? I’m guessing that not a lot of hands are raised right now! With the smart timer, the toothbrush stops vibrating every 30 seconds in order for you to brush all four corners of your mouth. Brilliant and I’ll take it! The toothbrush heads are angled and felt great. I never got the feeling they were brushing too hard and they didn’t bother my gums at all. They are made from premium DuPont™ bristles and clean both the surface of your teeth and in-between. The head clicks on to the toothbrush easily and the replacement heads are available and at a very reasonable price. One concern I had with the cariPRO toothbrush was the battery life. I really don’t want another item on my bathroom counter and also the worry over whether or not the battery has enough power. Great news → I’ve only charged the toothbrush twice since receiving it! Both times were right before I was traveling and I wanted to make sure it wasn’t going to die on me during that time. The charging dock is very simple and I only have it out on my counter when I’m needing to charge the toothbrush. The battery will last up to four weeks on a full charge, so it’s easy to grab the charger only when needed. Ever since I started using the cariPRO toothbrush, I feel like my teeth are cleaner and whiter which gives you a much healthier feeling! I’m due for my next cleaning at the dentist soon, so I’ll be curious to see if he notices a difference! If you would like to give the cariPRO toothbrush a try, Smile Brilliant is offering my readers a 20% discount if you use the code stephaniecarls20 during checkout. I’d love to hear what you think of it! If you do have any questions, check out their FAQ section here. You can also WIN A CARIPRO TOOTHBRUSH! Have you ever thought about the technology that goes in to making your shampoo and conditioner? Yeah, probably not. But what about using technology to customize the shampoo and conditioner JUST.FOR.YOU?! Now that’s what I’m talking about! 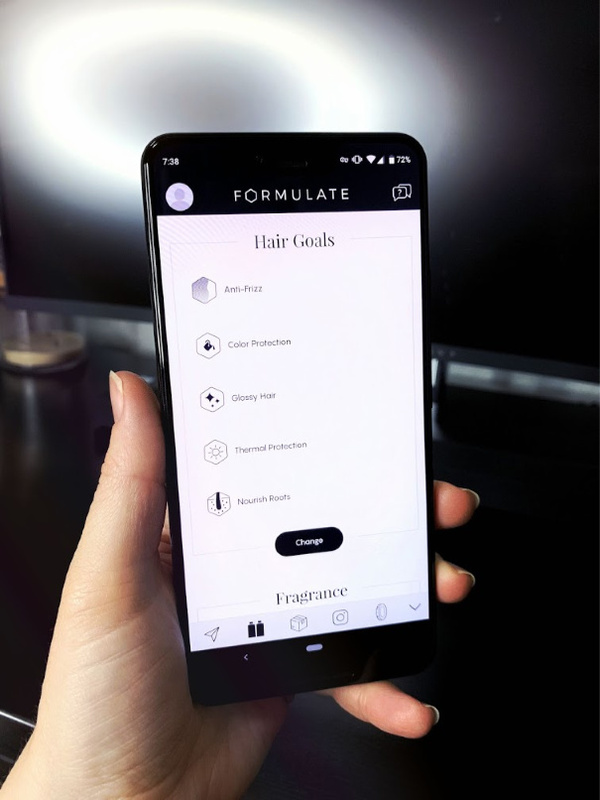 Formulate reached out about testing out their app and their customized shampoo and conditioner. As a tech girl, I immediately downloaded their app and spent some time going through it. It’s sleek, well thought-out and provides one of the best user experiences I’ve seen. Using their app, or even their website if you wanted, you are taken through a series of questions about your hair, your hair goals, your lifestyle, environment, etc. With all the information you provide, they can then engineer a perfect match for your hair. You are even able to choose a scent that you appeals to you and it’s strength. I’m one of those girls that loves being able to have great smelling hair, so mine is personally set at STRONG! Once your delivery arrives (and boy are these bottles GORGEOUS! ), not only will you have the best shampoo and conditioner for YOU, you have the best customer service behind you. The team at Formulate will check in on your formulas and if something isn’t right, they will work with you to get the right formula in your hands and in your hair — FREE! Their formulas are also preservative-free, sulfate-free, paraben-free, and cruelty-free. This is something we can ALL get behind! My hair feels healthy, shiny, and this formula is da bomb! I can easily go a couple of days without washing it as my hair isn’t weighted down with unnecessary products and chemicals. Who ever thought you’d have a way to customized your hair care? Thankful for Formulate! Now, it’s YOUR turn to try Formulate! They were sweet to offer a giveaway for you! The giveaway ends on February 1st and is for US residents only. ALL entries will receive $5 off their purchase and free shipping. This has been an exciting year for our family as both boys have been playing soccer and loving it! The huge smiles as goals are scored and defense is on point are ones we will never forget. We are also very aware that these memories are precious ones as not every child has the opportunity to run out on the field with friends and score that winning goal. They are champions though as they are fighting for their lives after being diagnosed with cancer or a blood disorder. About 70-85 children in the Austin area are diagnosed with some type of cancer or blood disorder each year. Drew and I have a long-standing relationship with Superhero Kids which was founded to specifically address quality of life issues for children and their families battling these issues at the Dell Children’s Blood and Cancer Center. This year, Drew and I will be volunteering at the Superhero Kids’ annual holiday event which brings approximately 800 patients and families together for an unforgettable evening. The children and families are treated to dinner, dancing, pictures with Santa, carriage rides, face painting, and gifts for each child. This is where we would love to bring in our friends and family to help with this evening. We are looking for your help in donating soccer balls for these special children by Thanksgiving. This Amazon list has two different soccer balls (one green and one pink) that would be a perfect fit for them. Choose your favorite and by clicking on the “Add to Cart” from the list, it chooses the correct size, but if any issue arises, size 4 is the preferred size of the ball. When checking out, there is an address attached to the list that will ship the ball to me. Please do not add gift wrap to the order. Thank you so much for your generosity! It will be such a treat to share these balls with the children on the night of the party.